Violinists, violists and cellists use tuning pegs daily to adjust the tones of each string on their instrument. In violinmaking, the appropriate friction is necessary to keeping a well-tuned, playable string in place. Pegs enter through holes drilled in the peg box, the container of pegs between the scroll and the fingerboard on the violin neck. The holes themselves are perfectly rounded and even; the pegs have a more conical shape, losing width towards the ends. Pushing the pegs into the holes creates a wedge effect, as the wider part of the peg sticks to the edge of the hole. To achieve the right amount of friction, the peg and peg hole need to be fitted properly. An unruly peg will shift back and forth and have a difficult time preserving the desired tuning. Pegs should fit tightly and not require much pressure to keep them where they are put. Pegs that are evenly installed each protrude evenly from the peg box and are parallel to the axis of the instrument. Proper shaping is done with highly specific reamers and cutters. Only then a fine sanding should reach between 400 and 600 grit without being excessive and disrupting the taper of the fit. The right compounds will allow the pegs to turn easily while retaining adjustments. Despite factors like humidity, which can distort the size of the peg, a proper installation can compensate. Though peg drops or peg dope are an easy fix, most slipping pegs are the result of improperly installed strings. Relying completely on the pressure of the tuning pegs will wear them out fast. 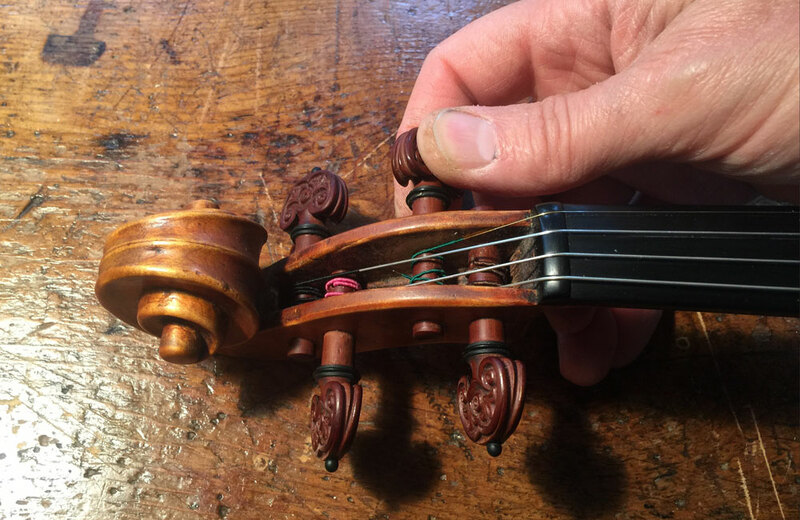 After the string is placed across the violin and through the peg hole, it must be wound so that it creates an additional wedge effect against the inside wall of the scroll box. It should be pulled towards the box as it is wound, so that continued winding creates more pressure. Appropriately installed strings are necessary to keeping the pegs tight, and are the responsibility of every serious instrumentalist.